Alfredo cream sauce swirled around spicy melted cheese and buffalo chicken pieces, all stuffed inside homemade pizza dough. 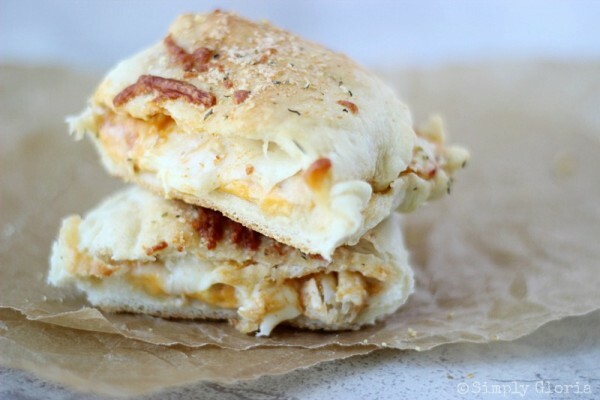 These Buffalo Chicken Alfredo Pizza Pockets are so delicious, you won’t be able to stop at just one! Any shape and flavor is a staple in our home. Pizza is the easiest solution when you have quite a few hungry young men in the house, like I do. If you were to ask me what the most requested lunch item here in the sometimes 24/7 Phillips’ Cafe… it’s these Buffalo Chicken Alfredo Pizza Pockets. Especially when it comes to them craving buffalo sauce and chicken– and pizza! I make these so much (about every other week, but who’s counting? ), I’m surprised the boys still request them! I’ve perfected this dough to where the texture is very tender, and with a mild taste. To sum it all up about the dough itself– it is amazing! This is a no-rise kind of dough. The only rising in the method of making this, is the proofing the yeast. Very easy! It’s the very first step of starting the dough. Put the sugar, yeast, and warm water mixture in a draft free zone and let it get bubbly and foamy. It usually takes about 10 minutes. Yes, it’s that easy! I’m constantly being asked, are they done yet? So, in order to not hear them continually remind me how much they are starving, I’ve already got it pulled out of the oven and they are ready to chow! Besides, who really has time to wait for this homemade dough to sit and rise for it to become these amazing pizza pockets? These are a breeze to put together. This recipe is great to use with leftover chicken, for when you don’t know what to do with it! The Alfredo sauce is quick to make while your yeast mixture is off doing it’s thing– proofing. Then you have everything ready and set off to the side. As soon as you are done kneading the dough, (or if your dough hook has done all the work for you) then you are going to be ready to top half of each sectioned dough with the cheeses, Alfredo cream sauce, chicken pieces, and buffalo sauce. With the combination of the creamy Alfredo sauce and tangy spicy sauce in with the chicken and spicy cheese, it really balances it all out. Not too spicy and definitely full of flavor! As I’ve shared with you before of how pizza is perfect for those run-out-the-door meals… these are also that kind of meal, too! Alfredo cream sauce swirled around spicy melted cheese and buffalo chicken pieces, all stuffed inside homemade pizza dough. 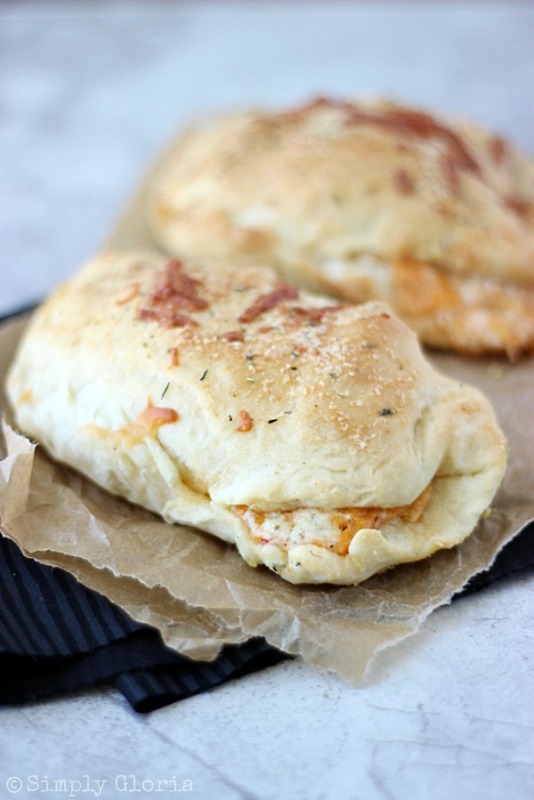 These Buffalo Chicken Alfredo Pizza Pockets are so delicious, you won't be able to stop at just one! Pour in 1 cup of heavy whipping cream and seasonings. Whisk together until cream cheese has melted and all combined. It will become thick. Stir in grated Parmesan and set aside. Put yeast and sugar in a small bowl, add the warm water and stir. Set aside for 10 minutes. Heat the milk (warm to the touch) with 2 tablespoons of butter, until melted. Set aside. Put one and a half cups of bread flour and salt into a large mixing bowl. Add the proofed yeast and milk mixture into the flour mixture. Mix by hand or with a dough hook on low speed. Slowly add the rest of the flour while it is mixing. Keep mixing until the dough has pulled away from the sides of the bowl. (About 5-8 minutes.) Add additional flour one tablespoon at a time, if needed. Take dough out of the bowl and set onto a clean surface. Do not flour the surface. Cut the dough in half and then into quarters, making 8 pieces of dough. When flattening each ball of dough, simply hold it between your hands and work it out with your fingers in a circular motion. Your dough may end up in a circle or a rectangle. Whichever one is fine. 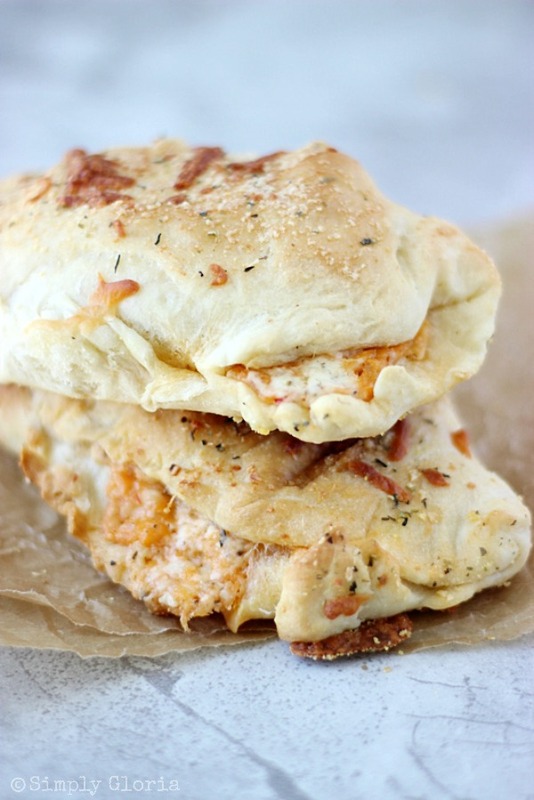 Fill one side of the dough with layering the spicy cheese, Alfredo sauce, chicken pieces, buffalo sauce, and mozzarella. *Fold and pinch together the edges closed. Use a dough scraper or a flat spatula to lift up the filled dough. Sprinkle cornmeal on a covered baking sheet. Put each pizza pocket onto the baking sheet, 1/2 inch to an inch apart. Add the garlic powder to 2 tablespoons of melted butter. Brush melted garlic butter on the tops of dough and sprinkle grated Parmesan cheese on the top. Bake in a preheated 350 degree oven for 25 to 30 minutes. Or until golden brown on the tops. 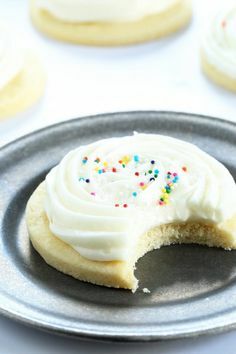 *How to pinch and seal the ends of the dough together: Press the top piece of dough with your left finger and pull up the bottom piece of dough with your right hand to fold up and over. These freeze really well, individually wrapped. Makes 8 individually pizza pockets. « Show Stopper Saturday #46 ~ Chocolate Desserts! These look amazing! 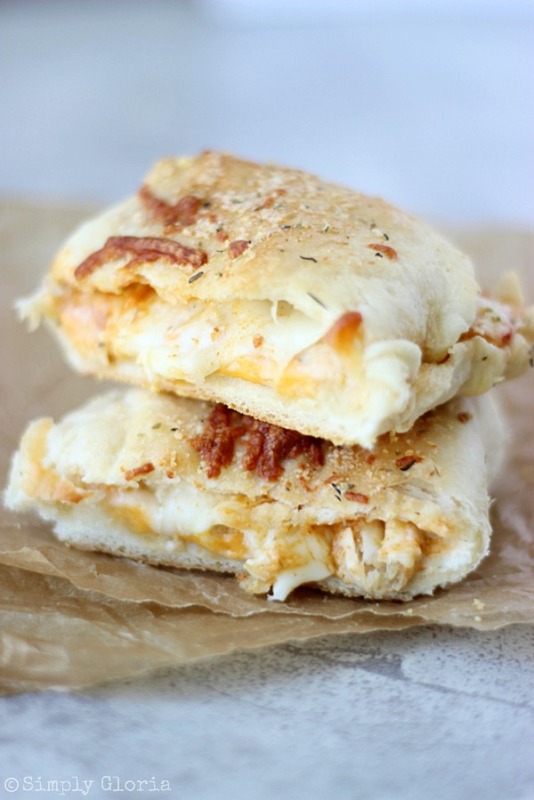 I love buffalo chicken so I really need to make these! My guys love pizza pockets. They ask for them all the time! These look so great. Definitely Pinning!! These pockets look so cheesy gooey delicious! No wonder your boys are always requesting them! No rise time?! Finally a homemade pizza dough that fits my schedule! Thanks, Gloria! Well, you know how I feel about your pizza pockets, so I’m definitely going to have to give this version a try!! YUM! 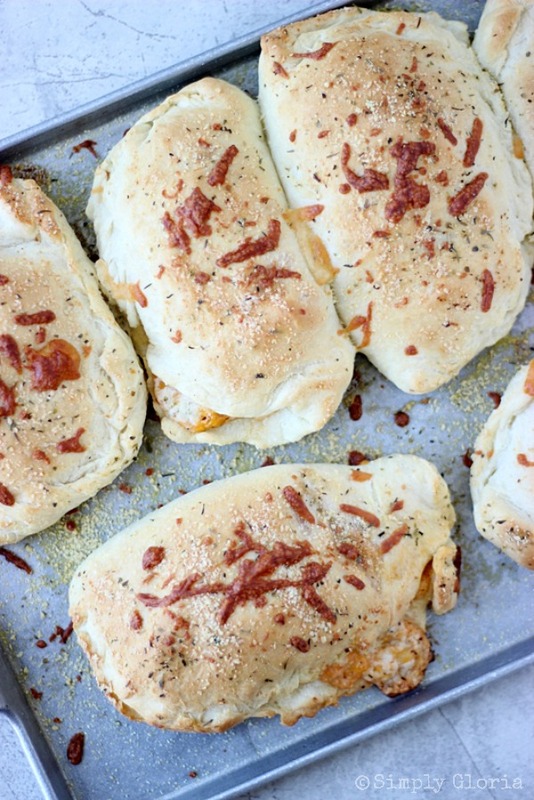 These pizza pockets look amazing! My husband’s favorite flavor? Buffalo. Mine? Alfredo. This is a match made in heaven for us! These are to die for, Gloria! I haven’t been eating gluten for over a month, but I might cheat for one of these! Andi @ The Weary Chef recently posted…Easy Weekly Dinner Menu #76: Easy Dinner Ideas Handpicked for You! That is how I feel about anything with Alfredo; can we just stop counting how many times we eat it? I don’t think it matters anymore haha! Oh man, you had me at buffalo chicken. I’ve decided pizza becomes 10x better at your house – you make the best variations Gloria! These look yummo! We love pizza in any form too! These pizza pockets looks really really good. What a great alternative to the stuff you get in the freezer section. Never again! Oh lawd!! This sounds so good. I love the filling of these pockets…creamy and spicy!!!! Can’t wait to try. I can see why are requested so much!! 🙂 Pizza in any form is a hit in my house! Pinning! Hello Friend! Catching up from my vacation and liking these tasty pockets – some of my favorite flavors – pinned and sharing!! Hope you are doing well!! I love that this entire recipe is from scratch Gloria! These pockets just made the menu for the week – they look amazing! Pinned! These are amazing Gloria! I have made them twice for my family now and they love them! I ran out of the seasonings for the Alfredo sauce the last time I made them, and substituted a package of ranch seasoning- wow what a punch of flavouring it gave! I also recommend dipping the pockets in blue cheese dressing when you eat them for the full buffalo chicken experience!